28-Oct-2001 -- After my unsuccessful assault on 37°N 118°W, I was all the more eager to nail my first confluence. I realized that, at this stage in the game, it was going to take a major effort to get to one of the unclaimed confluences (there are now only 6 left in the entire Southwestern United States, two of those are on restricted federal land, the remaining 4 are in rugged Arizona backcountry). So, after a bit of philosophical reflection, I decided to go back to basics and visit some of the easier local confluences that had been first visited a year or more earlier. I figured that I could make up for not being the first by visiting more of them, or doing something else to make the visit special, like taking better pictures or telling a more interesting story. Another possibility is that René and I could be the first people to visit all 44 California confluences (now that would be an accomplishment). So my wife René and I set out on Sunday afternoon for 37°N 122°W. René is a Santa Cruz native, so when I told her we were visiting De Laveaga Park, she knew exactly where we were going. It only took half an hour to get there from Los Gatos, and when we parked at the main club house for the public Golf Course, we were already less than a quarter mile from the confluence. With my Garmin Etrex Vista pointing the way, we walked across the 10th green (which is right next to the parking lot), being careful not to interfere with the golfers. From there we hiked downhill from an embankment down to a stand of Redwood trees, and that was it... we were there. We were a bit embarrassed because we had gone to the trouble of scrambling down through the underbrush when there was a perfectly good trail less than a hundred feet away. But no matter, we had nailed our first confluence! 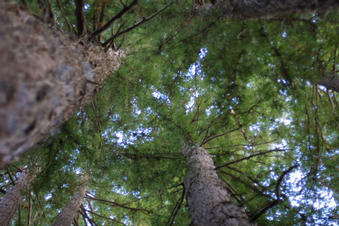 It was an overcast October afternoon and with the tree canopy it was going to be difficult to get my "all zeroes shot". In fact it took me so long that my wife got impatient with me and hiked back to the club house! After another fifteen minutes I was able to join her. Fortunately the club house had a mascot cat and René had spent the time bonding with it. René and I want to come back to this area again soon, since De Laveaga Park is less then a mile away from the famous "Mystery Spot", a local tourist attraction in the woods where strange effects occur that distort perspective and seem to alter gravity. In particular, I am eager to see if the Mystery Spot has any unusual effect on my GPS (yes, I know I'm a nerd, get over it ;-). Over the next few weeks I'll be visiting some of the other local Bay Area confluences, and as the desert hiking season gets into full swing, I may just try my luck on one of the unclaimed ones (wish me luck). But I did find it quite satisfying to visit an already-claimed confluence. After all, Columbus wasn't the first to discover America, he just did it "better" then anyone else and got the credit! Please visit my web site www.rssnet.org for more information about my adventures with René, including detailed trip reports and more pictures. #1: The view looking straight up from the Confluence. #2: The Confluence is on this trail near the Redwoods on the left. #3: The 10th Green at De Laveaga Park in Santa Cruz. #4: This trail leads from the Green to the Confluence. #5: My first "All Zeroes" shot! #6: My wife René and her new friend.